If you create content and use LinkedIn to build your credibility and expertise, this post is for you. Notice the word create, not curate or share. Posting long form original content on LinkedIn is a win-win. Not your company’s, not someone you know; your original thoughts and expertise. I encourage you to consider whether creating your own content will help you professionally in both the short term and long term. You might be working for someone else but somewhere down the road aspire to have your own business. Would it be easier to make this transition if you are known and can provide proof you are an expert? Maybe. I’m thrilled when someone tells me they are publishing on LinkedIn because I know the power and potential that LinkedIn’s publishing platform offers members. So often though, when I check out their profile, I cringe a bit (less now than before, my immunity to bad postings is building). They’ve posted jobs, events, links (yes, just a link), articles from their organizations without attribution, a paragraph of random thought. Please don’t do that. Be careful because as much as LinkedIn’s network creates a web of opportunity, it can also highlight, (much like a bad profile) a lack of professionalism, thoughtfulness and credibility. “Share an update” is a quick link or comment that is delivered to your network. It is served up to your LinkedIn network on their Home Page. It is a transient piece of content and can be either original or third party (think curated). “Publish a post” is a full blog post, short article, short post and video, etc. that you create in LinkedIn’s word editor. This long form content (typically 350 words plus) creates a new Section on your LinkedIn Profile called Posts. LinkedIn members can read your original content directly from your LinkedIn Profile. They can then like, comment or share it with their networks. If you have a fair amount of engagement on your post, LinkedIn will then serve it up to more LinkedIn’s members providing you a larger audience and potentially new opportunities. 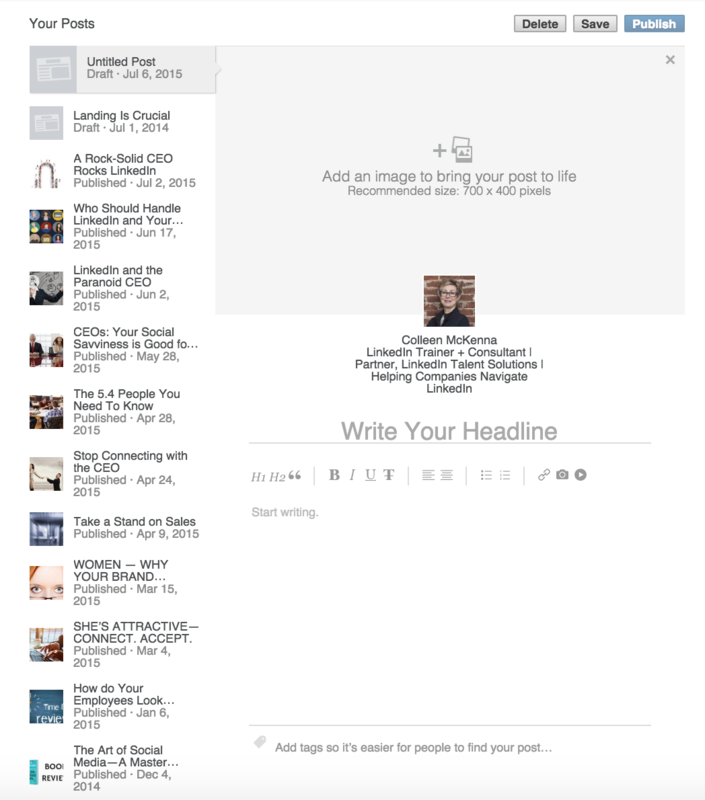 Publishing content is a game changer on LinkedIn. Granted you are using someone else’s platform, not your own (like you do with your website) but if you are trying to build your professional brand nothing beats LinkedIn to garner a larger network. Here are 6 tips for how to publish your original content on LinkedIn. 1. 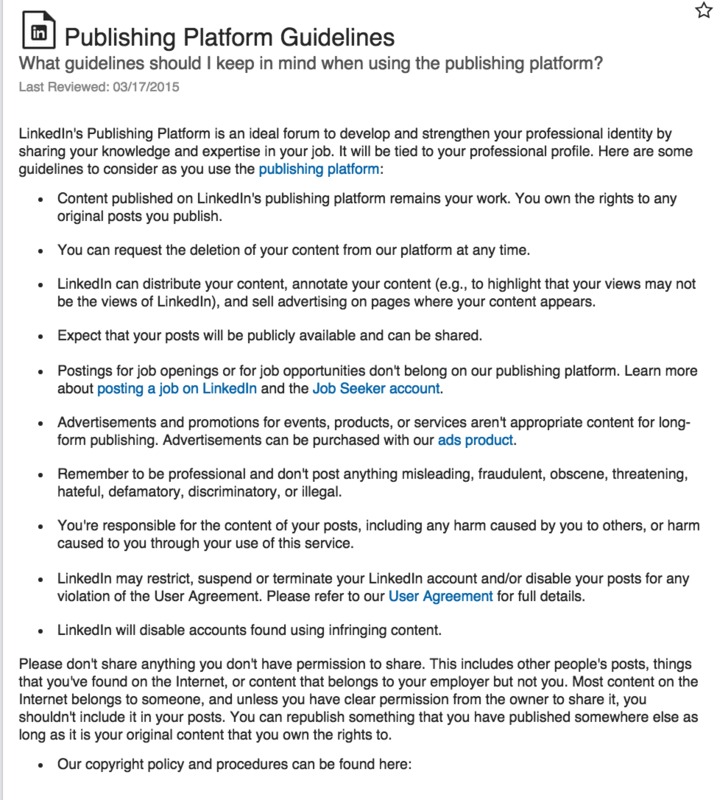 Understand LinkedIn’s rules. Check out their Overview. Their guidelines are clear and they walk you through best practices. Please note they are clear about what is not advisable to publish and you should be too. 2. Consider what you are going to write about. Have a plan so that when others are noticing your posts they begin to hang together to increase your credibility. You can have a random post every now and then but someone should be able to look at your content and understand why you are writing about that subject. Check out 5 Ways to Create a Likeable Content Marketing Strategy. 3. Make sure your images are sized correctly and are not low resolution and pixelated. This just looks bad. LinkedIn encourages you to add a photo that is 700×400 pixels. Vertical formats don’t work so well. 4. You may not have an official editor but find someone who will read your content, give you honest feedback and fix those grammatical mishaps. Be open to their feedback. 5. Add “tags” so LinkedIn knows where your topic may fit on Pulse, which is their news and insight aggregator. 6. Review your post stats. 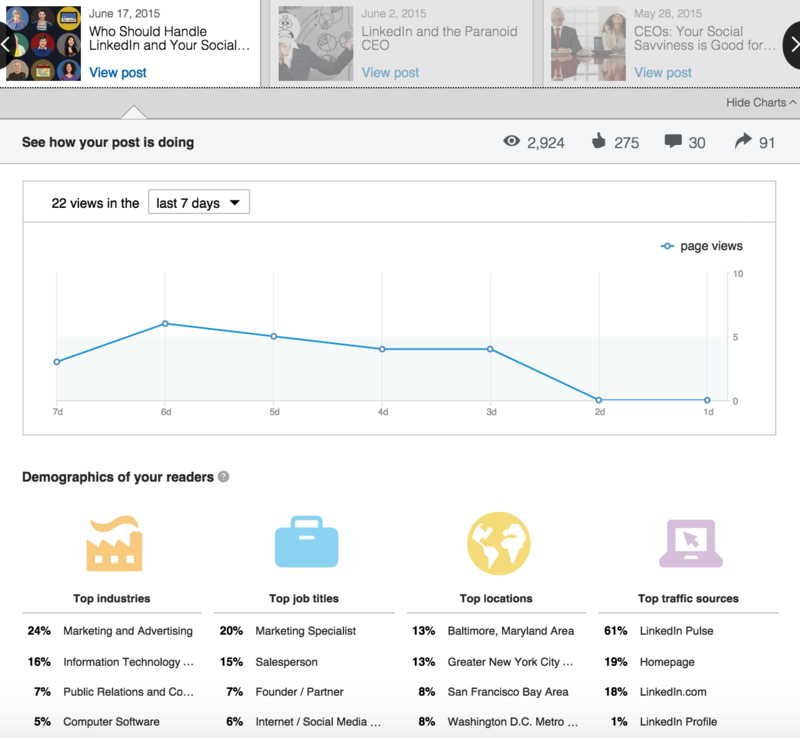 LinkedIn provides an overview of your posts so you can see what resonates with your network. Page views, likes, comments and shares are all visible, and even better, scroll down the page and see the demographics of your readers by industry, title, location and source. (find your Analytics: go to Who’s Viewed Your Profile >> Who’s Viewed Your Posts). I always like to do a bit of googling to see what I can learn as I write How-to posts and I came across a post from 2014 that is worth a look if you are serious about posting on LinkedIn. I rarely post on Sundays but a couple of months ago I posted “Woman — Why Your Brand Matters” on a Sunday morning while doing some other work in LinkedIn. It has been my most successful post to date. Note Paul Shapiro’s analysis shows Sunday is the second best day to post. Note to self: post Sunday and Thursday and test out his analysis. There is no question that LinkedIn offers you a platform for amplifying your content, your messaging and your brand. Test and tweak your content until you land on a winning formula and then push the envelope just a bit further.